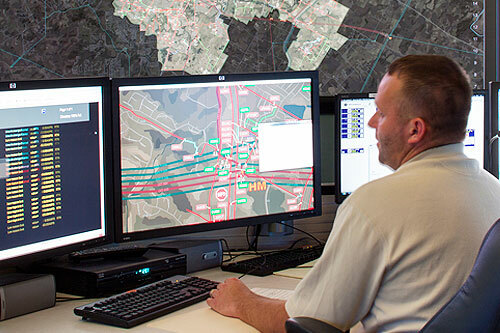 Graphical User Interface | Primate Technologies, Inc.
Primate's real-time user interface, works in conjunction with their data monitor to provide control room operators, dispatchers and the support staff with a visualization tool that renders the true state of their system. Primate's graphical user interface displays diagrams, geographic territories, mapping, charts and trends over surfaces while meeting high performance metrics of real-time updates for graphics and animation. 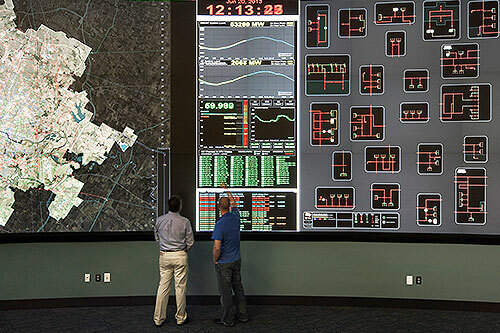 MISSION CRITICAL RESPONSE SUPPORT: Real-time visualization techniques which allow for an immediate response to emerging conditions. SVG VALIDATION: Displays SVG (scalable vector graphic) one-line diagrams, computer network diagrams, contour mapping, charts and trends. REAL-TIME VISUAL INDICATORS: Placement of graphics and operator pins and notes, typically used as visual aids to categorize elements and indicate alerts. BUILT IN AUTOMATED FEATURES: Use the built-in viewer to provide additional features such as the rapid pan and zoom. LOGS & BACK-UPS: Audit trail backups are retained for all operator interactions with the display. REPLAY EVENTS: Easily playback important events that have been stored from a previous shift.